I have nodes with PDF files linked. When clicking "Import all annotation" or "Import new annotation" Docear imports all sort of stuff which is there in the PDF file: my bookmarks, my notes and things which the publisher have put there: table of content, list of figures, bookmarked paragraphs etc. Sometimes it's a big pile of annotations. All what's not mine is for me mostly clutter which I delete anyway. Problem is I have to delete loads of stuff each time I update a note. Is there a chance to import only MY annotation? I think PDF-Xchange remembers who is the author of the each annotation. unfortunately there is no way to automatically decide which annotations are created directly by you, by a colleague or by the publisher. The Monitoring feature (on your Literature & Annotations map click the refresh icon) only imports PDF annotations you have not used in your Library mind maps yet. The Incoming node beneath it serves as repository for all the annotations you have not already organized in your map. So, if you cut the annotations and put somewhere in one of your Library maps (e.g. the Trash map), these annotations will not be imported again by the monitoring feature. Thanks for the answer, Stefan. Can't say it looks like a straight forward solution :-/ I'll give it a try. Keep up with the good work! we know that it'S not obvious. But we think that the monitoring concept in general, which only imports unused annotations from your PDF files is very helpful in order to track what you have read recently and need to organize. I had same problem and I find some threads which exactly the same. currently I've manage the issue using your tricks and adding new mindmaps and separating Books,PPTs from papers which are the main resources. 1. As you said, having publisher bookmarks comes handy and it's a good feature. But in my point of view some times it's very annoying esp when the number of annotations is huge. I've near 20 Books on a topic and they all have a lot of Bookmarks,Sections,Figures,Glossaries,Indexes,... working with such a huge annotations are useless. 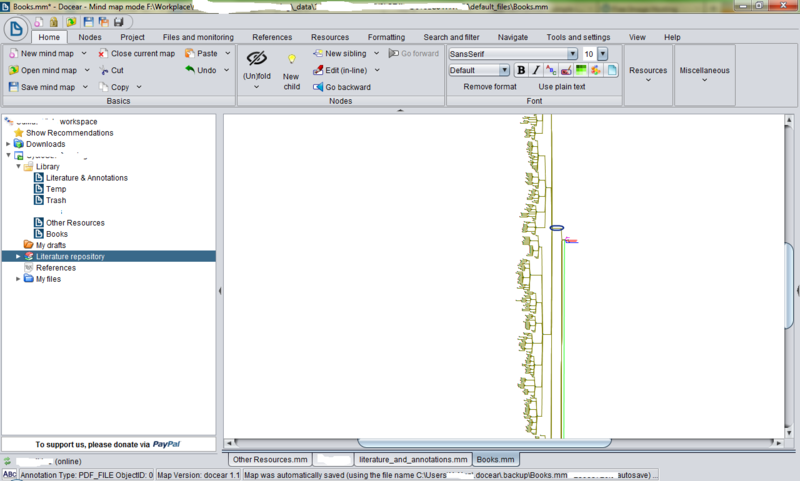 Tens of thousand of annotations was loaded in my mindmap, make zooming out really slow. So it's a good idea to have an option for simply ignore initial annotations for a node and just monitor the new ones (just like your tricks) but more handy. 2. figuring out the author for annotations are really hard. but what about time of creation? Is it possible to filter annotations based on Time? I mean specify a Time (e.g. importing time, publication time,...) and Docear will just show annotations from that specific time and not before. 3. It's also possible to globally set Docear not to import Bookmarks in "Settings>PDF Management" but I don't like this solution, It would be better if the user could choose to set this option on a node or not. It is not possible right now and I think it is no solution. If you start to use Docear now and buy a new book next year the annotations of the book (if defined correctly in the first place) are very new and Docear will import them. Can you explain this in detail? Anyway, creating any filters on a base like "ignore these 20 currently selected bookmarks" means that you need to import the bookmarks first, click them, and select to ignore them. It's basically the same to move these bookmarks to the Trash map in order to get rid of them. Plus you have an easy way to un-ignore them by just removing the nodes from this map. I personally only use comments (or comments created from highlighted text) to annotate my documents. If you don't need bookmarks you should definitely think about deactivating bookmark import. Correct, I was wrong at the first try. I'd deactivated the bookmark option but nothing changed (imported bookmarks was still there) and I've also defined some personal bookmarks...currently I've deactivated the bookmarks and my problem has solved. Bookmarks for the papers are still exist (previously imported) but I can remove them manually if needed. For me this is the best solution (+moving to trash). Finally, just as an offer, I didn't find a way to delete all child nodes (other than manually select (shift+move is best) and move). If there isn't it will be very good option to easily delete all bookmarks. For example the below image is just the part of bookmarks of one of my books. Also, currently I delete the bookmarks, sometimes moving them to trash is better, however for doing this we (as far as I know) I've to open another instance and drag the nodes to trash. Correct, I was wrong at the first try. I'd deactivated the bookmark option but nothing changed (imported bookmarks was still there) and I've also defined some personal bookmarks...currently I've deactivated the +bookmarks and my problem has solved. Bookmarks for the papers are still exist (previously imported) but I can remove them manually if needed. For me this is the best solution (+moving to trash). Finally, just as an offer, I didn't find a way to delete all child nodes (other than manually select (shift+move is best) and move). You may also want to play with the different "(Un)fold" options (at "Home > Nodes" in our menu ribbon) in order to get a better overview over your nodes and data. Also, currently I delete the bookmarks, sometimes moving them to trash is better, however for doing this we (as far as I know) I've to open another instance and drag the nodes to trash. I usually open both the source map (with the annotations I don't need) and the "Trash" map in one instance of Docear and that just tab through them using the <Ctrl>+<Tab> keyboard shortcut. You can cut nodes with <Ctrl>+<X> and paste them with <Ctrl>+<V>. You can also define new shortcut keys by holding down the <CTRL> key while clicking an action from the ribbon menu. Version: 1.0.33.2 ; Page loaded in: 0.095 seconds.